A fun and humorous bit of entertainment chronicling the making of the classic movie psycho, and the people behind the scenes. The movie about the making of a movie, hitchcock is a pretty fantastic film. That’s because it takes the approach of leaving no stone unturned and dives into everything about the man, his wife, and his relaionship with actresses. Aside from that it also chronicles his dealings with studio heads, and what it took to get this movie made and marketed. Anthony Hopkins plays the title character perfectly, and shows how Alfered Hitchcock was full of tricks and ideas. He knew what he wanted, and didn’t really care whether anyone else agreed or not. I love the way that he pulls strings and manipulates people into getting what he wants. The movie not only showcases the making of the movie Psycho, but also has a behind the scenes potential affair situation going on with Hitchcock’s wife, as well. Hitch gets to play detective here, feed his suspicions about what his wife is up to, and use them to fuel his energy towards making Psycho. The whole thing ends up being a lot of fun. Hitchcock is a movie about the making of the movie Psycho. In fact, the book that it was based on is called “Alfred Hitchcock And The Making Of Psycho.” and for the longest time, that was the working title of this movie too. I’m glad they dropped it. 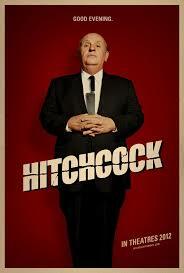 Hitchcock is a much catchier and quicker title. But the subject of the movie remains the same, and it is incredibly interesting. This is a very cool film that combines humor with the Psychology behind the characters. We get into the heads of the people involved with making their movie. Anthony Hopkins plays the title role of the master of suspense. He is superb in his performance. Starting some truly fantastic makeup work to make him look just like the man. Hopkins’ resemblance to Hitchcock here is worlds of improvement over the way Tobey Jones looked in the recent HBO film, The Girl. On top of that, Hopkins does all the right mannerisms and character traits, including the perfect lip movements, hand gestures, and ways of speaking. He completely captures Hitchcock’s essence, and gets both the madness and the playfulness just right. Hitchcock, the movie, has two main focuses. The first, of course, is the making of Psycho. This movie was Hitch’s biggest hit, and it’s also quite possibly his best film. It’s his first foray into the horror genre, and there’s also a hell of a story behind how the movie got made. Nobody wanted to touch it. The pieces came together in the late fifties, when everyone either really was wholesome, or else was pretending to be. You couldn’t even show a toilet on screen in those days, let alone a toilet flushing. Hitchcock wanted to show both, and with Psycho, he got his chance. He even found a way to show a woman in the shower, when the sensors were telling him at best, he could only show her silhouette through a window that was all fogged up. 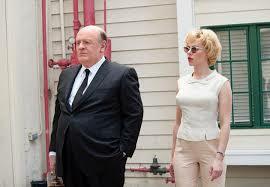 But this movie explains the trickery and manipulation that hitch used to beat the system. Altered Hitchcock was a big name in Hollywood, but not big enough to get everything green-lit that he wanted. When he met with executives at the movie studio about his next project, they really just wanted him to make more of the same. North By Northwest had just come out and was a smash hit, and they were really hoping he would make another version of that movie, only for them. Hitch had other ideas. Part of the appeal of Psycho is that the main character dies only a quarter of the way into the picture. For Hitch this was fascinating. For the studio heads, it was a nightmare. When the studios refused to bankroll the movie, hitch decided to mortgage his house in order to get the money. And so he financed the movie himself. He was that sure of it, or at least, of the fact that this was what he needed to do. What’s great about this movie is that it’s not just about getting the money, but also about dealing with the censors, casting, writing, and doing everything else. There’s even a scene with a guy playing Bernard Herman, the composer, and a discussion about that famous stabbing music. Hitchcock didn’t want any music during the stabbing, and it was others, such as his wife, who pointed him in a different direction. But only half of the movie is really about Psycho. Maybe a little more. The other half or so is about hitch’s relationship with his wife, Alma. She’s played by Helen Mirren, and is a strong and terrific character here. She even has scenes where she stands up to her overbearing husband and puts him in his place. The two of them might sleep in separate beds, but they are both very devoted to each other here, and have playful banter and energy. When Alma starts spending time out at a beach house with another writer, working on a script that they are writing together, Hitch becomes jealous. He starts thinking along the lines of some of his characters in his movies, and this film does something very smart. It treats the shots of Hitch like he would treat one of his movies. We suddenly get the over the top, heightening music and the hints that hitch plans to kill his wife. All of this is just for effect, of course, but it is really cool. Hitch has woman issues, and the jealousy over a man he thinks might be his wife’s lover is just one of them. Another is his relationship with the two actresses of the movie. Janet Leigh (Scarlet Johannsen), who is playing Marion crane here, and Vera miles (Jessica Biel) who is playing crane’s sister. Hitch has issues with these two as well, especially miles, who he once planned to make into a mega star until she got pregnant and chose a life of having a family instead. Hitch took this very personally and all of that comes out in this film. There is so much to love about this movie. The way that hitch plays detective and collects the sand from his floor to figure out that alma has been spending time at the beach, the interviews and impressions of Anthony Perkins and the screenwriter for Psycho, the way hitch found ways to make the censors feel powerful, and yet still get what he was after. I love all the attention that is given to how Hitchcock made the presentation of Psycho and distribution of it by theaters into a show unto itself. He hired guards, spread messages, and made it look like the biggest secret in history. Not everything works about the movie, but certainly most of what it is trying to accomplish does. The only thing that didn’t work for me was the Michael Wincott fantasies, where Hitch was watching a killer at work. I’m not sure what any of this meant, and it certainly was never explained. Still, Hitchcock is a very impressive movie. The first thirty minutes or so are absolutely fantastic, loaded up with humor and with Hopkins really getting into his role. After that, we start getting into Psycho, and I love that this movie takes us through the hiring and casting process, (Ralph Macchio shows up as the screenwriter), and then into the filming of some of the scenes. The plot with the wife and the beach house is the weakest part of the film, and yet Hitchcock’s reactions to all of it are a lot of fun. This movie supposes that his suspicions over his wife having an affair actually led to the extreme violence of the shower scene, with Hitch picking up the knife himself and improvising the stabs. And I do love that the movie even gets into his strange relationships with his actresses and desire to change them, without dwelling on it the way the HBO film did. This movie has so much going for it. It’s a very smart and enjoyable film and has tremendous success with what it set out to accomplish.